A few weeks ago I received an email from Foodbuzz about POM Wonderful offering a contest. 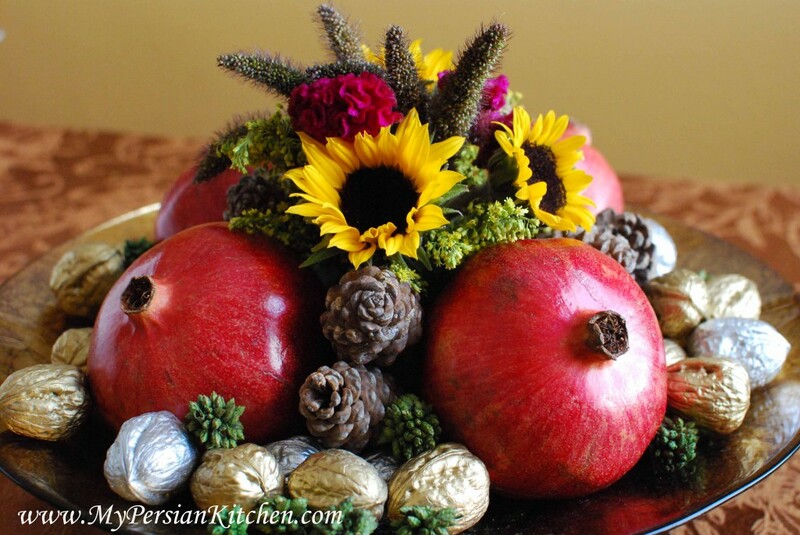 Needless to say that I immediately inquired and learned that the contest was all about creating a dinner party centered around pomegranates. Well hello!!!! I read the guideline, scratched my head and filled out the preliminary questionnaire to be considered as one of the bloggers participating in the contest. Then I patiently waited to see if I was going to be selected. When I received an email from POM Wonderful notifying me that I was one of the 100 folks selected from around the country to host a POM Dinner Party, I jumped and screamed from excitement. I just knew that this year’s “Pomegranate Week” would be hell of exciting! Let me begin with what helped with the vision of the POM Dinner Party. First, please watch this video! Wouldn’t you want him to come over and deliver some Pomegranate Juice to you? I totally would!! Sadly, the fine Persian Warrior from the video didn’t deliver the box full of pomegranate and promo goodies that POM sent over for the party. Frankly, I was all ready to feed him some pomegranate to help him with his invincibility in case he encountered some enemies that needed to be battled!!! But no such luck! I decided to hold the POM party on my mom’s last night here as a little goodbye party. The two of us had a great time experimenting and brainstorming together for the recipes and I thought it would have been a great last meal together. My mom and the Sous Chef helped me set the table. I have to tell you that they were both mighty patient with me as I experimented and moved things around to make it all look right! 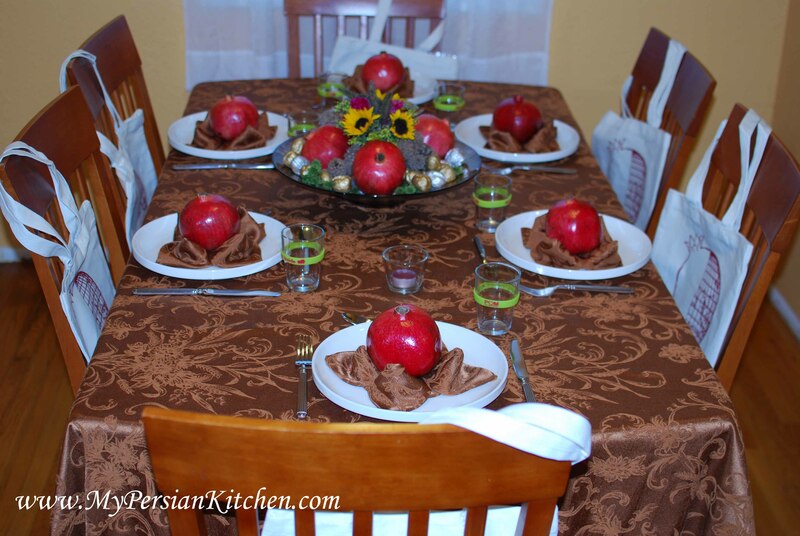 Our dinner table was beautifully set using some of the pomegranates that were sent by POM. Each guest had a bag of POM goodies set on their chair. Our table’s centerpiece was a fabulous arrangements made by yours truly using some fresh flowers, cones, painted walnuts, and of course, what else, pomegranates!!! I wanted some fall colors but also a variety of colors. 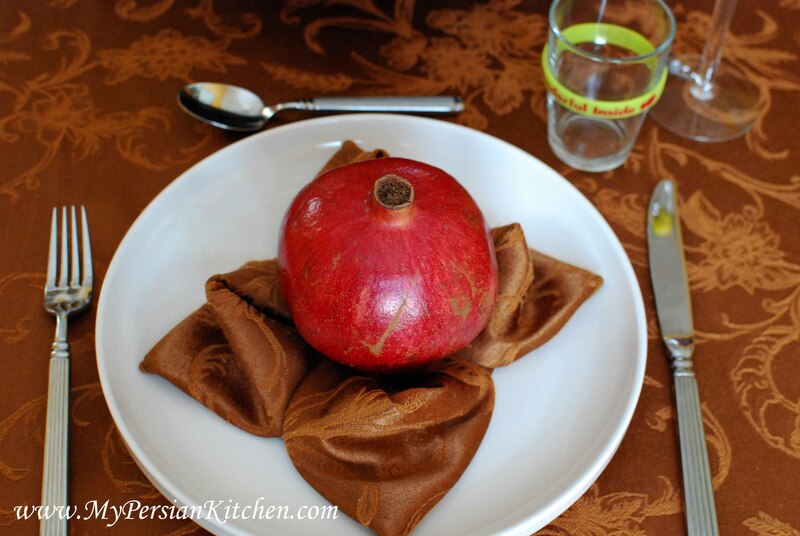 I loved the contrast between the red pomegranates against the brown linens and white plates. 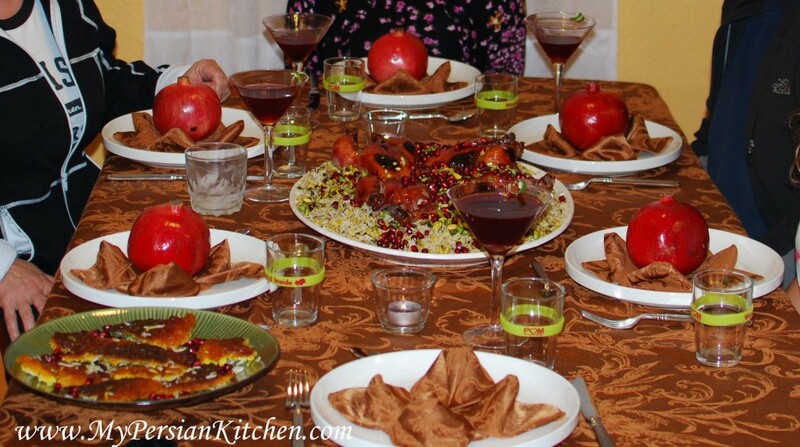 Each plate had a napkin carefully folded into a Lotus Fold with a pomegranate sitting right in the middle of it. The POM promo bags each had a bracelet in them. I placed the bracelet around each glass so that the guests could take them and wear them when they sat at the table! 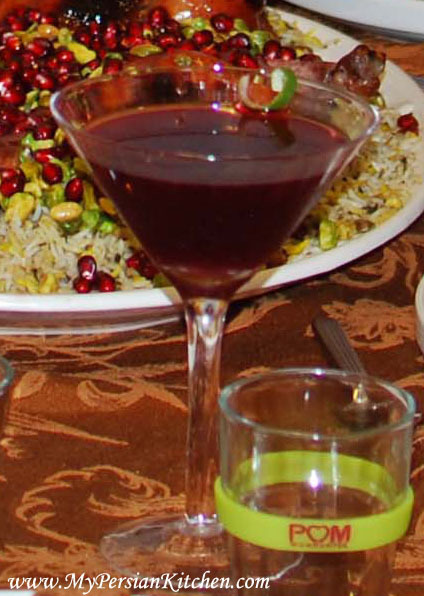 Each guest was greeted with a My Persian Kitchen POM Dinner Party signature cocktail: Persian Ruby! You ask what’s in a Persian Ruby? My people’s favorite alcoholic drink: Vodka! I think it is safe to say that Iranians love vodka and it is a staple at our parties. Since the theme of the party was anything and everything pomegranate, we added some delish POM juice! Ironically, when I posted on my FB account about the pomegranate extravaganza, my cousin from my father’s side Firouzeh shared with me that a few years back, while she was visiting our cousin Nazi, they drank vodka with pomegranate juice and then danced the night away! After reading that I knew I was on the right track of mind!!! What can I say, great minds think alike! To get the party started we also had a nice plate of appetizers which featured three different types of cheese and Salami. 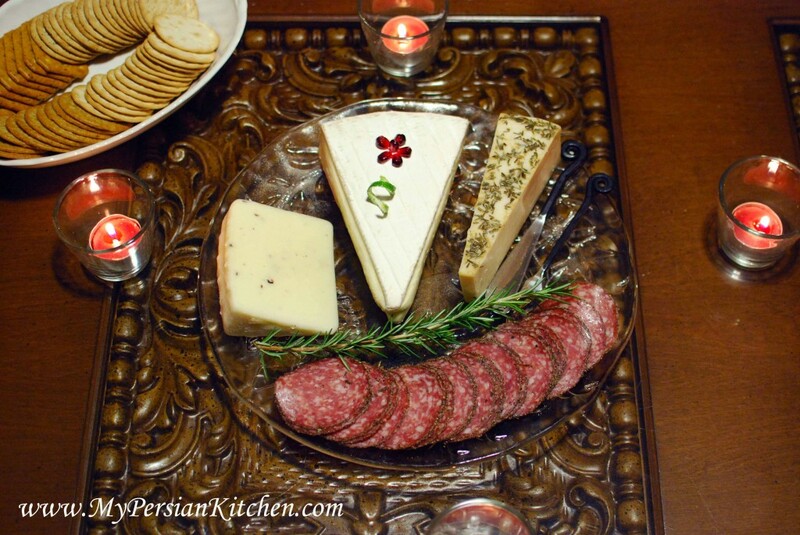 The cheese selection was: French Brie, decorated with pomegranate seeds, Italian Truffle Cheese, and Rosemary & Olive Oil Asiago. Mix all ingredients together with ice cubes in a shaker. Pour into martini glasses. Decorate glass with lime peel. Next up is the rest of our menu: Persian Rice with Pistachio & Pomegranate, Cornish Hen with Pomegranate & Lime Glaze, and Pomegranate Granita. But wait there is more!!! A tutorial on how to easily open and eat a pomegranate!!! Stay tuned!! Pomegranate Week 2010 is officially in full swing!!! 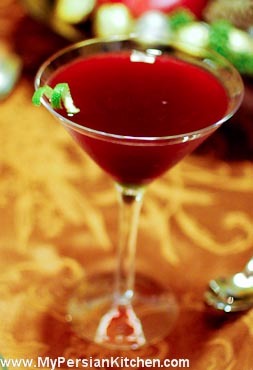 Thank you, I’ve never thought of making a cocktail with pom juice (ab anar) and vodka. We usually use sour cherry juice (ab albaloo). What’s your opinion about adding a dash of salt to Persian Ruby? Unfortunately all the pom juice here, have some kind of sweetener in them. Your Fesenjan recipe is one of the best English recipe for this kind of stew that I ever read. I’m looking forward for this week of Pomegranate. P.S. The perception of persia in that Ad was somehow odd. Dr. Faust, I have never had vodka with abeh albaloo. Oh my I can’t imagine it being nothing but delicious!!! I have every intention of making that cocktail next year when sour cherries are in season! 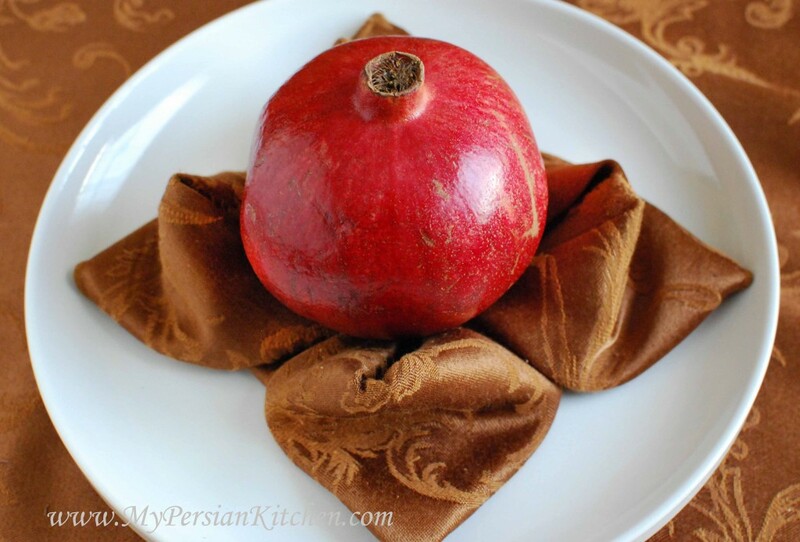 I will try a dash of salt next time I make the Persian Ruby to see how it taste. I am so glad you like my Fesenjan recipe!! Gorgeous centerpiece, table and place settings!! Janelle, thank you!!! It was a lot of fun! Lovely! 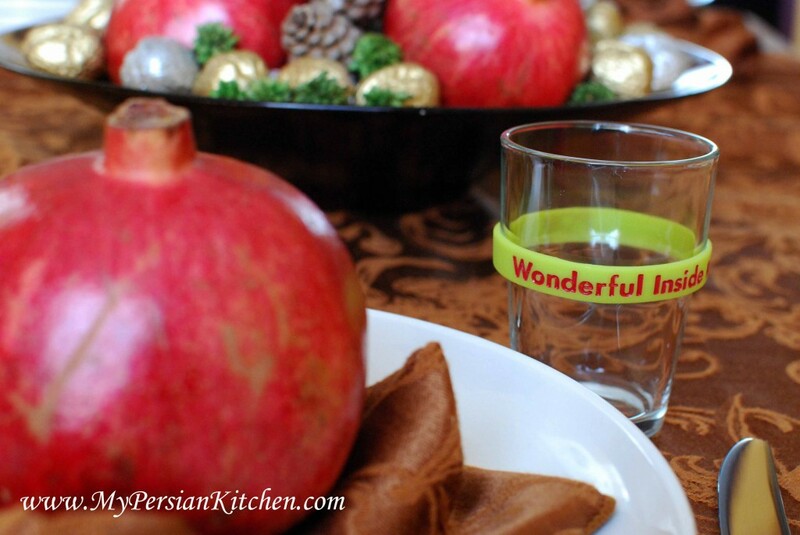 Vodka is indeed Persian Juice!